But it is the highest profile movie to ever have an alien invastion/attack set in the Old West. And it is pretty well executed, too. Jon Favreau, an actor and director who came to fame thanks to Iron Man, took the reins for this one and he did a fairly good job with it. If you like the directorial style of Iron Man and Iron Man 2 then you'll like his work here. Like Iron Man, he has a very good cast assembled here to bring this story to life in a convincing fashion. 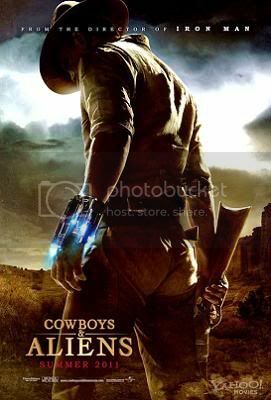 What's more, the same sense of fun and adventure is on display in Cowboys & Aliens as well. Daniel Craig leads the cast as an outlaw with a serious case of amnesia. He has flashes of memories, but they don't mean much to him. He discovers who he is as we do, which, again, isn't new to the movies, but it is well done here. Also in the cast is none other than Indiana Jones himself - Harrison Ford. Or maybe Han Solo would have been a better name to drop, after all - this is a Science Fiction movie. But it's also a Western, so the Indiana Jones thing works well, too. Ford brings a sense of authority and has a commanding presence in his role as Woodrow Dolarhyde, a ruthless rancher who sees himself as above the law. His biggest problem is his son, who is a 19th century slacker and is always getting in trouble because he knows his father will bail him out. Craig's character turns out to be the outlaw Jake Longergan, who had given up his life of crime to settle down. Without his memory, he's just a badass gunman who knows how to take care of himself. When he runs across Dolarhyde's son, Percy (played by Paul Dano), he puts the kid in his place. This, of course, puts him on the wrong side of old Colonel Dolarhyde, who wants to handle punishing his son himself (and won't let anyone else do it). As Dolarhyde and his men confront the local sheriff aliens attack. And that's where the real fun begins. What works best about Cowboys & Aliens is that both the Western and Science Fiction stories are handled very well. If not for the aliens this could have been a very solid Western. If not for the Western setting this could have been yet another solid alien invasion Science Fiction movie. The problem could have been in blending the two seemingly disparate genres. Instead, these two genres are blended together seamlessly. The screenwriters did a great job of making everything fit. 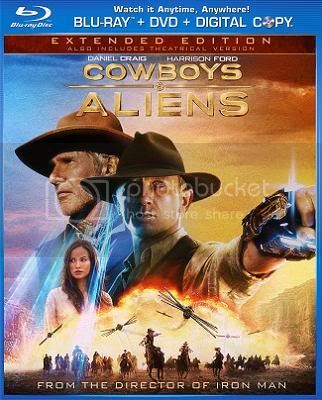 Now, is Cowboys & Aliens a great movie? No, it's not. Very little here is of the highest level of Westerns or Science Fiction movies, and the combination doesn't elevate either aspect of the movie. But there isn't anything here that isn't at least fairly well done, and most of it is quite good. The script is good, the direction is good, and the acting by just about everyone is good. 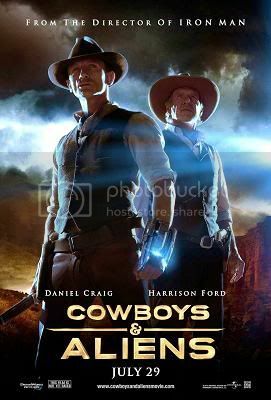 Ultimately, Cowboys & Aliens is exactly what the filmmakers intended it to be - a very entertaining movie, but nothing too terribly serious. On that count it is a rousing success. The Blu Ray is very good as well, with an extended cut also on the disc. The picture quality is not quite Avatar good, but above average. The DVD picture quality is above average for a DVD as well, but not much above average. Picture and sound is not an issue with this release (and since it is a new release it merely meets expectations of being crisp, clean, and clear).